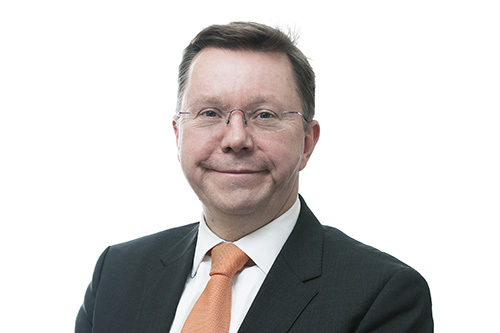 Smith & Nephew plc (LSE:SN, NYSE:SNN), the global medical technology business, today announces the appointment of Graham Baker as Chief Financial Officer. He will formally begin the role on 1 March 2017 when he will also be appointed to the Board as an Executive Director. Graham joins from Alvogen, a fast-growing generic pharmaceuticals company, where he is Chief Financial Officer. Alvogen has 35 offices globally across US, Europe and Asia and is owned by the founder and major private equity firms led by CVC and Temasek. Prior to Alvogen, Graham worked for AstraZeneca PLC for 20 years, holding multiple senior roles including, most recently, Vice President, Finance , International (2013-2015) with responsibility for all emerging markets, Vice President, Global Financial Services (2010-2013) and Vice President Finance & Chief Financial Officer, North America (2008-10). Graham qualified as a Chartered Accountant and Chartered Tax Advisor with Arthur Andersen. He is a British national. No further disclosure obligations arise under paragraphs (1) to (6) of LR 9.6.13 R of the UK Listing Authority’s Listing Rules in respect of this appointment. Mr Baker will be paid in accordance with the Remuneration Policy approved by shareholders in 2014, as set out in the Annual Report 2015. He will receive a base salary of £510,000 per annum and participate in the Annual Incentive Plan (cash and equity) and the Performance Share Plan. He will also receive a payment in lieu of pension and standard benefits as set out in the Annual Report. An updated Remuneration Policy will be put to shareholders for approval at the 2017 AGM and any future awards will be subject to performance conditions and measures in force at the time of the award. His notice period will be 6 months, 12 months from the Company. No additional payment will be made on recruitment. Reflexion Health, Inc., a digital healthcare company, in conjunction with the Duke Clinical Research Institute (DCRI) announced the enrollment of the first patients in Virtual Exercise Rehabilitation In-home Therapy: A Research Study (VERITAS), which is designed to evaluate the cost and outcomes of using a virtual rehabilitation platform to deliver physical therapy following total knee replacement (TKR) surgery. According to the Centers for Disease Control and Prevention, 700,000 total knee replacements are performed each year in the United States. TKR is the most frequently performed procedure in the hospital and is more common among women than men.1 The average Medicare expenditure for surgery, hospitalization, and recovery ranges from $16,500 to $33,000 across geographic areas.2 With a significant growth in TKR among younger adults with knee osteoporosis3, an aging population working longer, and a shift to value-based care, the demand for TKR surgery is expected to exceed three million by the year 2030 while at the same time, healthcare systems will continue to optimize costs. VERITAS is a multi-center, randomized controlled trial and will enroll approximately 300 adult participants scheduled for TKR surgery at six U.S. sites. The treatment group will include 150 adults who will receive Reflexion Health’s proprietary virtual exercise rehabilitation assistant, VERA™, both pre- and post-surgery, compared with a control group of 150 adults who will receive traditional in-home or clinic-based physical therapy at participating sites. Clinical outcomes, health service use, and costs will be examined for three months after surgery. The Duke Clinical Research Institute (DCRI), part of the Duke University School of Medicine, is the largest academic research organization in the world. Its mission is to develop and share knowledge that improves the care of patients through innovative clinical research. The DCRI conducts groundbreaking multinational clinical trials, manages major national patient registries, and performs landmark outcomes research. DCRI research spans multiple disciplines, from pediatrics to geriatrics, primary care to subspecialty medicine, and genomics to proteomics. The DCRI also is home to the Duke Databank for Cardiovascular Diseases, the largest and oldest institutional cardiovascular database in the world, which continues to inform clinical decision-making more than 40 years after its founding. Reflexion Health is a digital healthcare company dedicated to transforming traditional medicine and improving clinical outcomes by using innovative technology solutions to deliver patient-centered care at reduced costs. VERA™, Reflexion Health’s signature solution, is an FDA-cleared Virtual Exercise Rehabilitation Assistant that detects motion and remotely monitors the effectiveness of prescribed physical therapy in real-time. VERA brings the guidance of a physical therapist into the home to coach and motivate patients through recovery from joint replacement surgery or as a preventative therapy to reduce falls. For more information, visit www.reflexionhealth.com and follow us at @ReflexionHealth. 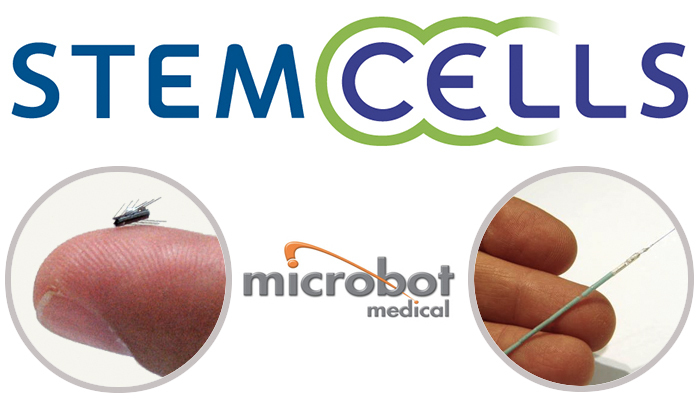 Israeli company Microbot, which three months ago announced its merger into Nasdaq-listed US company Stem Cell, yesterday announced that the merger had been completed. Microbot was founded as investment company MEDX Ventures Group, led by Harel Gadot and based on technology developed by Prof. Moshe Shoham, who also developed the technology of Mazor Robotics Ltd. (Nasdaq: MZOR; TASE:MZOR), a company with a $550 million market cap. Microbot develops miniature robots. The companies first app is for cleaning drainage pipes in the body, for example in the urethra or the brain, thereby removing the necessity for surgery to replace them. The miniature robot functions in the same way as a robot that cleans swimming pools or homes. It is made of titanium, and has arms that move around it. It can be controlled from outside the body and directed within the urethra, so that accumulations of dirt are released, and can be swept out of the drain. In the future, the product is likely to also prove suitable for cleaning plaque from blood vessels in order to prevent heart attacks and stroke and obviate the need for a balloon or stent. More remote apps include a robot with a camera for taking photographs within the body (like Given Imaging’s camera pill, but with the added capability of controlling the location and camera angle) and release of a drug in a specific place. WESTMINSTER, Colo., Nov. 30, 2016 /PRNewswire/ — Cerapedics, a privately-held orthobiologics company, today announced the company has been awarded a group purchasing agreement with Premier Inc., a leading healthcare improvement company, for Breakthrough Technology: Bone Tissue Synthetic Implantable Products. The new agreement allows Premier members, at their discretion, to take advantage of special pricing and terms pre-negotiated by Premier for i-FACTOR™ Peptide Enhanced Bone Graft. The contract is effective December 1, 2016. HAYWARD, Calif.–(BUSINESS WIRE)–Moximed®, Inc. announced today that the first patient has been treated in an FDA-approved IDE study for its latest generation unicompartmental unloading implant, the Atlas System. 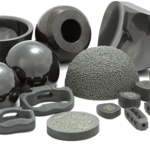 The Atlas System builds on the company’s eight years of clinical success with joint unloading implants for medial knee osteoarthritis (OA). The Principal US Investigator of the previous Moximed clinical study (KineSpring System), Jack Farr, M.D., Director of the OrthoIndy Cartilage Restoration Center of Indiana and the OrthoIndy Sports Medicine Fellowship Program remarked, “The Atlas System provides the same 30 lbs. of joint unloading with a significantly smaller implant and anatomically-guided surgical technique. Patients intuitively understand the concept of a shock absorber and are excited about a procedure that preserves their own anatomy without the bone cuts associated with joint replacement.” He went on to say, “I am looking forward to enrolling my first patients in the Atlas Study.” His site in Indianapolis, Indiana is now open and recruiting patients. 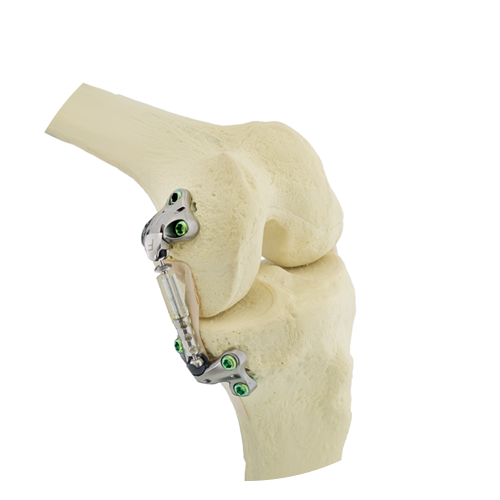 The Atlas System is designed as an implantable joint unloader for patients with medial knee osteoarthritis. Placed subcutaneously alongside the knee joint, the Atlas System incorporates advanced biomaterials designed to provide a clinically beneficial 30 lbs. of unloading. Importantly, the Atlas System absorbs excess joint load rather than transfer load to otherwise healthy areas of the joint. The Atlas System features a streamlined surgical technique that uses the patient’s own anatomy and allows the surgeon to visually confirm device function during the procedure. Finally, the Atlas System is joint preserving, and patients maintain all future treatment options should their osteoarthritis become more severe. DUBLIN – November 22, 2016 – Medtronic plc (NYSE: MDT) today announced financial results for its second quarter of fiscal year 2017, which ended October 28, 2016. 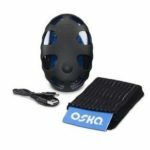 The company reported second quarter worldwide revenue of $7.345 billion, an increase of 4 percent, or 3 percent on a constant currency basis. Foreign currency had a positive $50 million impact on revenue. Second quarter GAAP net income and diluted earnings per share (EPS) were $1.115 billion and $0.80, increases of 114 percent and 122 percent, respectively. As detailed in the financial schedules included through the link at the end of this release, second quarter non-GAAP net income and diluted EPS were $1.561 billion and $1.12, representing increases of 6 percent and 9 percent, respectively. After adjusting for the negative 6 cent impact from foreign currency, non-GAAP diluted EPS increased 15 percent. The second quarter GAAP operating margin was 18.9 percent, a 50 basis point improvement. As detailed in the financial schedules included through the link at the end of this release, the second quarter non-GAAP operating margin was 28.9 percent on a constant currency basis, a 150 basis point improvement. U.S. revenue of $4.152 billion represented 57 percent of company revenue and increased 1 percent. Non-U.S. developed market revenue of $2.209 billion represented 30 percent of company revenue and increased 8 percent, or 5 percent on a constant currency basis. Emerging market revenue of $984 million represented 13 percent of company revenue and increased 8 percent, or 10 percent on a constant currency basis. The Cardiac and Vascular Group (CVG) includes the Cardiac Rhythm & Heart Failure (CRHF), Coronary & Structural Heart (CSH), and Aortic & Peripheral Vascular (APV) divisions. CVG worldwide revenue of $2.584 billion increased 4 percent, or 3 percent on a constant currency basis, driven by CRHF growth from the recent acquisition of HeartWare and strong growth in other CRHF businesses, as well as growth in APV. CSH revenue growth was flat as strong growth in Structural Heart partially offset declines in Coronary. CRHF revenue of $1.400 billion increased 6 percent, or 5 percent on a constant currency basis, driven by growth from the company’s recent acquisition of HeartWare, high-twenties growth in AF Solutions on a constant currency basis, mid-teens growth in Diagnostics on a constant currency basis, partially offset by declines in core cardiac rhythm implantables, which declined in-line with the global market. CSH revenue of $753 million was flat on both a reported and constant currency basis. Structural Heart was driven by high-teens growth on a constant currency basis in transcatheter aortic heart valves as a result of strong customer adoption of the CoreValve®Evolut® Coronary declined in the mid-single digits on a constant currency basis, driven by double-digit declines in drug-eluting stents in the US and Japan, as the company awaits approval of Resolute Onyx(TM). This was partially offset by mid-single digit growth on a constant currency basis in drug-eluting stents in Western Europe resulting from continued strong sales of the Resolute Onyx(TM) platform. APV revenue of $431 million increased 5 percent, or 4 percent on a constant currency basis, with low-single digit growth on a constant currency basis in the Aortic business, driven by the success of the Heli-FX®EndoAnchor® The Peripheral Vascular business grew in the mid-single digits on a constant currency basis, with mid-twenties growth on a constant currency basis in drug-coated balloons, driven by the clinically differentiated IN.PACT® Admiral® DCB, which holds the leading market position in the U.S. and globally. The Minimally Invasive Therapies Group (MITG) includes the Surgical Solutions and the Patient Monitoring & Recovery (PMR) divisions. MITG worldwide revenue of $2.473 billion increased 5 percent, or 4 percent on a constant currency basis, led by MITG growth drivers, primarily Open-to-MIS, Emerging Markets, and Renal Care, as well as contributions from recent acquisitions and strength in Ventilation. 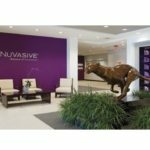 Surgical Solutions revenue of $1.361 billion increased 5 percent, or 4 percent on a constant currency basis, driven primarily by its Open-to-MIS growth driver, including strong product sales from Valleylab(TM) FT10 energy platform and continued performance in endo stapling specialty reloads. In addition, there was solid contribution from Emerging Markets with overachievement in Latin America and China. The division also benefitted from the recent acquisition of Smith & Nephew’s gynecology business. At the same time, Surgical Solutions growth was offset in the U.S. by competitive pressures stemming from reprocessing of advanced energy instruments, and in the Middle East from the timing of tenders. PMR revenue of $1.112 billion increased 4 percent, or 3 percent on a constant currency basis, driven by mid-single digit growth in the Respiratory & Patient Monitoring business as a result of strong sales of the Puritan Bennett(TM) 980 ventilator. The Renal Care Solutions business benefitted from the recent acquisition of Bellco. The Restorative Therapies Group (RTG) includes the Spine, Brain Therapies, Specialty Therapies, and Pain Therapies divisions. RTG worldwide revenue of $1.826 billion increased 4 percent, or 3 percent on a constant currency basis. Group results were driven by mid-single digit growth in Brain Therapies and Specialty Therapies and continued improvement in Spine, offsetting declines in Pain Therapies, all on a constant currency basis. 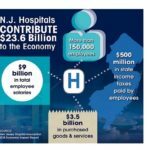 Spine revenue of $663 million increased 2 percent, or 1 percent on a constant currency basis, the division’s strongest growth in 7 quarters. The Core Spine business grew in the low-single digits in the U.S., as the focus on “Speed-to-Scale” new product launches is driving improved results. BMP grew in the low-single digits on a constant currency basis, with high-single digit growth in the U.S. partially offset by the loss of InductOs(TM) sales in Europe as a result of a shipping hold. Brain Therapies revenue of $506 million increased 7 percent, or 6 percent on a constant currency basis. Neurosurgery grew in the high-single digits on a constant currency basis, driven in part by strong imaging and navigation capital equipment sales. Neurovascular grew in the mid-single digits on a constant currency basis, slower growth than in prior quarters due to a recently announced voluntary recall of certain product lines. Brain Modulation grew in the low-single digits on a constant currency basis on the strength of the company’s MR conditional Activa DBS portfolio. Specialty Therapies revenue of $369 million increased 6 percent on both a reported and constant currency basis. All three businesses contributed to growth, with Advanced Energy growing in the low-double digits, Pelvic Health growing in the high-single digits, and ENT growing in the low-single digits, all on a constant currency basis. Pain Therapies revenue of $288 million decreased 2 percent on both a reported and constant currency basis. After adjusting for the divestiture of the division’s drug business, which occurred in the third quarter of fiscal year 2016, Pain Therapies revenue increased 1 percent on a constant currency basis. This was a result of mid-single digit declines on a constant currency basis in Spinal Cord Stimulation, as the business faced competitive pressures, partially offset by the Interventional business, which grew in the high-single digits, and Drug Pumps, which grew in the mid-single digits, both on a constant currency basis. The Diabetes Group includes the Intensive Insulin Management (IIM), Non-Intensive Diabetes Therapies (NDT), and Diabetes Service & Solutions (DSS) divisions. Diabetes Group worldwide revenue of $462 million increased 3 percent on both a reported and constant currency basis. Growth was slower this quarter than in previous quarters due to the dynamics associated with the U.S. FDA approval of the MiniMed® 630G System and earlier-than-expected U.S. FDA approval of the MiniMed® 670G System, which the company expects to become commercially available in the Spring of 2017. IIM grew in the mid-single digits on a constant currency basis, including mid-teens growth on a constant currency basis in International markets as a result of continued strong sales in Europe and Asia Pacific of the MiniMed®640G System. This was offset by low-single digit declines in the U.S. driven by the timing between approval and shipments for both the MiniMed® 630G System and MiniMed® 670G System. In addition, the company is deferring a portion of its MiniMed® 630G System sales due to its Priority Access Program. NDT grew in the high-thirties on a constant currency basis, led by strong sales of the iPro®2 Professional Continuous Glucose Monitor (CGM) technology with Pattern Snapshot to primary care physicians. DSS grew in the low-single digits on a constant currency basis as a result of growth in consumables, Diabeter clinics in Europe, and continued strong growth of the MiniMed®Connect, offset by the impact of buying patterns due to the previously mentioned insulin pump approvals. The company today updated its fiscal year 2017 revenue and free cash flow outlook and EPS guidance. Consistent with the company’s long-term, mid-single digit constant currency revenue growth expectation, the company now expects fiscal year 2017 revenue growth to be within the mid-single digit range on a constant currency, constant weeks basis, as opposed to the upper half of the mid-single digit range signaled previously. The company expects revenue growth for the second half of fiscal year 2017 to also be in the mid-single range on a constant currency basis. While the impact from foreign currency is fluid, if current exchange rates remain similar for the remainder of the fiscal year, the company’s full year revenue would be negatively affected by approximately $20 million to $60 million, including an approximate $10 million to $30 million negative impact in the third fiscal quarter. In addition, the company updated its diluted non-GAAP EPS guidance for fiscal year 2017. The company continues to expect fiscal year 2017 diluted non-GAAP EPS growth to be in the double digits on a constant currency, constant week basis, which is consistent with the company’s long-term, double digit constant currency EPS growth expectation. The company expects non-GAAP diluted EPS growth for the second half of fiscal year 2017 to be in the 8 percent to 10 percent range on a constant currency basis. While the impact from foreign currency is fluid, taking into account the estimated 8 to 10 cent impact from the extra week in the first quarter last fiscal year, as well as an estimated negative impact from foreign currency to fiscal year 2017 EPS of 20 to 22 cents, assuming current exchange rates remain similar for the rest of the year, this growth guidance implies fiscal year 2017 non-GAAP diluted EPS in the range of $4.55 to $4.60. Starting this quarter, the company is modifying its free cash flow outlook methodology to more closely align the company’s free cash flow projection with the results it reports each quarter. The company previously provided an adjusted free cash flow outlook, which would exclude cash payments related to non-GAAP items that might occur during the year, and will now provide an actual free cash flow outlook, which includes these items in projected free cash flow. The company expects free cash flow for fiscal year 2017 to be in the range of $5 to $6 billion. Medtronic will host a webcast today, November 22, at 8:00 a.m. EST (7:00 a.m. CST) to provide information about its businesses for the public, investors, analysts, and news media. This quarterly webcast can be accessed by clicking on the Investor Events link at investorrelations.medtronic.com and this earnings release will be archived at newsroom.medtronic.com. Medtronic will be live tweeting during the webcast on our Newsroom Twitter account, @Medtronic. Within 24 hours of the webcast, a replay of the webcast and transcript of the company’s prepared remarks will be available by clicking on the Investor Events link at investorrelations.medtronic.com. To view the second quarter financial schedules and non-GAAP reconciliations, click here. To view the second quarter earnings presentation, click here. Both of these documents can also be accessed by visiting newsroom.medtronic.com. This press release contains forward-looking statements related to product and service growth drivers, market position and opportunities, the transforming healthcare environment, strategies for and sustainability of growth, benefits from collaborations and acquisitions, availability of and plans for cash, product launches, and Medtronic’s future results of operations, which are subject to risks and uncertainties, such as competitive factors, difficulties and delays inherent in the development, manufacturing, marketing and sale of medical products, challenges with respect to third-party collaborations and integration of acquired businesses, effectiveness of growth and restructuring strategies, challenges relating to our worldwide operations, challenges or unforeseen risks in implementing our growth strategies, government regulation, fluctuations in foreign currency exchange rates, future revenue and earnings growth, and general economic conditions and other risks and uncertainties described in Medtronic’s periodic reports and other filings with the U.S. Securities and Exchange Commission (the “SEC”). Anticipated results only reflect information available to Medtronic at this time and may differ from actual results. Medtronic does not undertake to update its forward-looking statements or any of the information contained in this press release. Certain information in this press release includes calculations or figures that have been prepared internally and have not been reviewed or audited by our independent registered public accounting firm, including but not limited to, certain information in the financial schedules accompanying this press release. Use of different methods for preparing, calculating or presenting information may lead to differences and such differences may be material. This press release contains financial measures and guidance, including free cash flow figures (defined as operating cash flows less property, plant and equipment additions), revenue and growth rates on a constant currency basis, net income, and diluted EPS, all of which are considered “non-GAAP” financial measures under applicable SEC rules and regulations. Unless otherwise noted, all revenue amounts given in this press release are stated in accordance with U.S. generally accepted accounting principles (GAAP). References to quarterly figures increasing or decreasing are in comparison to the second quarter of fiscal year 2016. Medtronic management believes that in order to properly understand its short-term and long-term financial trends, including period over period comparisons of the company’s operations, investors may find it useful to exclude the effect of certain charges or gains that contribute to or reduce earnings but that result from transactions or events that management believes may or may not recur with similar materiality or impact to operations in future periods (Non-GAAP Adjustments). 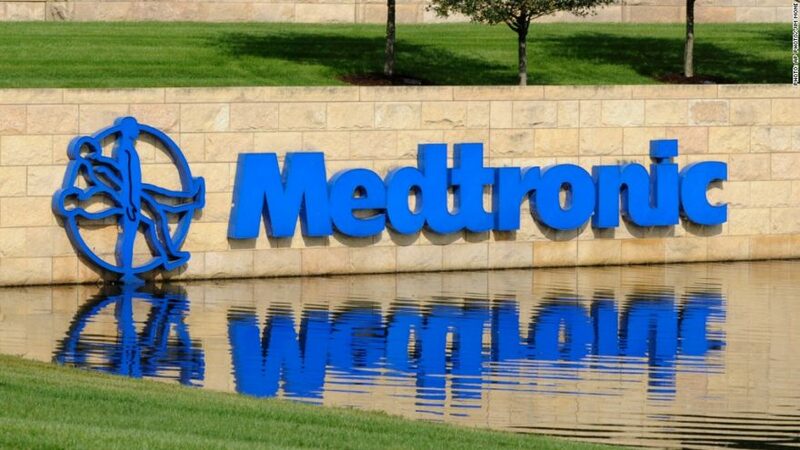 Medtronic generally uses non-GAAP financial measures to facilitate management’s review of the operational performance of the company and as a basis for strategic planning. Non-GAAP financial measures should be considered supplemental to and not a substitute for financial information prepared in accordance with GAAP, and investors are cautioned that Medtronic may calculate non-GAAP financial measures in a way that is different from other companies. Management strongly encourages investors to review the company’s consolidated financial statements and publicly filed reports in their entirety. Reconciliations of the non-GAAP financial measures to the most directly comparable GAAP financial measures are included in the financial schedules accompanying this press release. Medtronic calculates forward-looking non-GAAP financial measures based on internal forecasts that omit certain amounts that would be included in GAAP financial measures. For instance, forward-looking revenue growth and EPS projections exclude the impact of foreign currency exchange fluctuations. Forward-looking non-GAAP EPS guidance also excludes other potential charges or gains that would be recorded as non-GAAP adjustments to earnings during the fiscal year, such as amortization of intangible assets and acquisition-related, certain tax and litigation, and restructuring charges or gains. Medtronic does not attempt to provide reconciliations of forward-looking non-GAAP EPS guidance to projected GAAP EPS guidance because the combined impact and timing of recognition of these potential charges or gains is inherently uncertain and difficult to predict and is unavailable without unreasonable efforts. In addition, we believe such reconciliations would imply a degree of precision and certainty that could be confusing to investors. Such items could have a substantial impact on GAAP measures of financial performance. 1Etter, K., Lerner, J., de Moor, C, Yoo, A., Kalsekar, I. (2016). PMD10-Comparative Effectiveness of ATTUNE® Versus Triathlon™ Total Knee Systems: Real-World Length of Stay and Discharge Status.” Value in Health 19(3): A298. Premier Perspective™ Database analysis including 38 hospitals, representing 1,178 primary, unilateral TKAs with the ATTUNE Knee and 5,707 primary, unilateral TKAs with Triathlon™. The analysis found that the patients implanted with the ATTUNE Knee had statistically shorter length of stay and were more frequently discharged home vs. a skilled nursing facility compared to the TKAs with Triathlon™. 213th Annual Report 2016: National Joint Registry for England, Wales, Northern Ireland and the Isle of Man, Surgical Data to 31 December 2015, table 3.28. 3Clatworthy, M. (2015). An Early Outcome Study of the ATTUNE Knee System vs. the SIGMA® CR150 Knee System. DePuy Synthes Companies White Paper. DSUS/JRC/0814/0418. In an IRB approved early outcomes study, physiotherapists collected data on 40 patients implanted with ATTUNE Knees and 40 patients with SIGMA CR150 knees. The results demonstrated that patients implanted with the ATTUNE Knee had statistically significant improvements in some early outcomes, other outcomes demonstrated a trend favoring the ATTUNE Knee, and some outcomes were equivalent. 4Hamilton, W., Himden, S., Brenkel, I., Clatworthy, M., Dwyer, K., Lesko, J. and Kantor, S. Early Patient Reported Outcomes With New Primary vs. Contemporary Total Knee Arthroplasty: A Comparison of Two Worldwide, Multi-Center Prospective Studies. International Society for Technology in Arthroplasty (ISTA): e-Poster, 5-8 October 2016, Boston, MA. Based on interim data. The leading knee systems included: 89% PFC SIGMA, 3% Zimmer NexGen, 7% SHO Triathlon, 1% Other. 5Toomey, S., Daccach, J., Shah, J., Himden, S., Lesko, J. and Hamilton, W. Comparing the Incidence of Patellofemoral Complications in a New Total Knee Arthroplasty (TKA) System vs. Currently Available Products in Two, WorldWide, Multi-Center, Prospective Clinical Studies. While not statistically significant, the trend is promising and follow-up is ongoing. Based on interim data. 6Azhar, A. Mannen, E.,Smoger,L., Laz, P, Rulkoetter, P, Shelburne, K. Evaluation of In Vivo Mechanics for Medialized Dome and Anatomic Patellofemoral Geometries during Knee Extension and Lunge. Presentation at the International Society for Technology in Arthroplasty, 29th Annual Congress, Boston, MA, 5-8 October 2016. 7Ruiz D, Koenig L, Dall T, et al. The Direct and Indirect Costs to Society of Treatment for End-Stage Knee Osteoarthritis. J Bone Joint Surg Am., 2013; 95: 1473-80. AxioMed is pleased to announce the success of the first viscoelastic Freedom cervical case in Australia. Dr. Richard Laherty of Queensland Neurosurgery & Spine Surgery completed the procedure on Monday, November 28th at the Princess Alexandria Hospital in Brisbane, Australia. The procedure was performed on a 47-year-old male patient suffering from degenerative disc disease with radiculopathy, as a result of degenerative cervical discs at levels C5-7. The patient failed conservative treatments prior to undergoing surgery. The AxioMed viscoelastic disc is a next-generation disc replacement that restores natural disc height, lordosis, stability, and motion in the human spine. AxioMed was approved in September to market and sell their viscoelastic cervical and lumbar Freedom total disc replacements in Australia by the Therapeutic Goods Administration. Dr. Laherty currently practices general neurosurgery with a special interest in minimally invasive surgical techniques for management of complex spine conditions. Dr. Laherty graduated from University of Queensland and completed postgraduate fellowship training at Princess Alexandra Hospital, Brisbane and St. Vincents and Concorde Hospitals in Sydney. He is extensively involved in both research and training young neurosurgeons in the latest technologies via his roles at both Princess Alexandra Hospital and the University of Queensland. CAESAREA, Israel–(BUSINESS WIRE)–Mazor Robotics Ltd. (TASE: MZOR; NASDAQGM: MZOR), a pioneer and a leader in the field of surgical guidance systems, today announced that Mr. Yuval Yanai, a medical device industry veteran, has been elected to the Company’s Board of Directors, effective immediately. Mr. Yanai is a senior executive, who brings over 30 years of experience to Mazor. Currently Mr. Yanai serves as a Director in two publicly-traded companies listed on NASDAQ Global Market, Macrocure Ltd. and Check-Cap Ltd. Mr. Yanai also serves as a Director in two publicly traded companies listed on the Tel Aviv Stock Exchange, Medical Compression Systems (D.B.N) Ltd. and Clal Biotechnology Industries Ltd. In addition, Mr. Yanai serves as a Director of Haddasah Medical Center, Standard & Poors Maalot, Compulab Ltd. and Efranat Ltd. Mr. Yanai also acts as the Chairman of Endobetix Ltd. and the Israeli Fund for UNICEF. From 2005 through 2014, Mr. Yanai held the positions of Senior Vice President and Chief Financial Officer of Given Imaging Ltd., a developer and manufacturer of diagnostic products for the visualization and detection of disorders of the gastrointestinal tract. 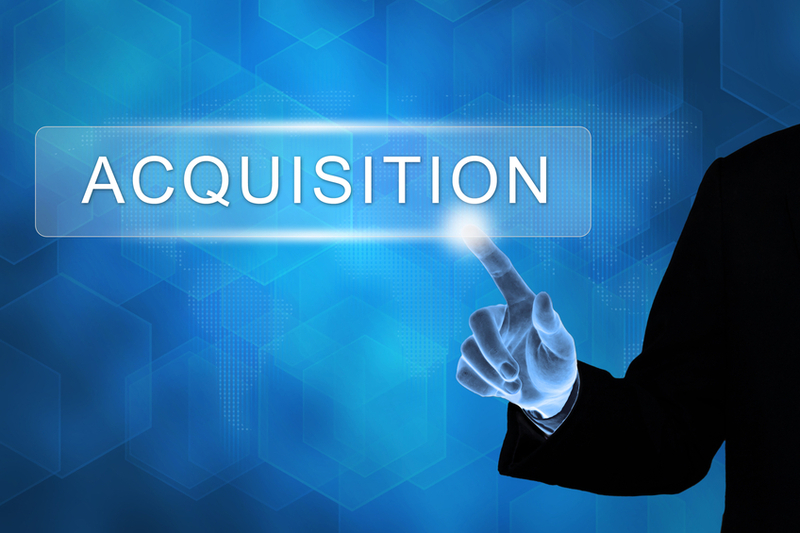 Given Imaging Ltd. was sold to Covidien Ltd. for $1 billion in 2014. Mr. Yanai holds a B.Sc. degree in Accounting and Economics from Tel-Aviv University. 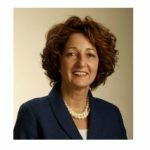 “I am pleased to welcome Yuval to Mazor’s Board of Directors. His experience with industry and publicly-traded companies enhances our Board of Directors as we seek to further leverage two key recent accomplishments – the strategic agreements signed in May with Medtronic and the successful October launch of the Mazor X system,” commented Jonathan Adereth, Chairman of Mazor’s Board of Directors. “Mazor’s performance and commitment to innovation have contributed to its position as the market leader in guidance systems for spine surgeries. I am looking forward to working with the Board and being part of Mazor’s continued success,” commented Mr. Yanai. This press release contains forward-looking statements within the meaning of the Private Securities Litigation Reform Act of 1995 and other securities laws. For example, we use forward-looking statements when we discuss our plan to further leverage our two key accomplishments – the Medtronic agreement and the overwhelmingly positive response to the Mazor X launch, and when we discuss our mission to continue to transform and redefine the standard of care for spine surgeries. These statements are only predictions based on Mazor’s current expectations and projections about future events. There are important factors that could cause Mazor’s actual results, level of activity, performance or achievements to differ materially from the results, level of activity, performance or achievements expressed or implied by the forward-looking statements. Those factors include, but are not limited to, the impact of general economic conditions, competitive products, product demand and market acceptance risks, reliance on key strategic alliances, fluctuations in operating results, and other factors indicated in Mazor’s filings with the Securities and Exchange Commission (SEC) including those discussed under the heading “Risk Factors” in Mazor’s annual report on Form 20-F filed with the SEC on May 2, 2016 and in subsequent filings with the SEC. For more details, refer to Mazor’s SEC filings. Mazor undertakes no obligation to update forward-looking statements to reflect subsequent occurring events or circumstances, or to changes in our expectations, except as may be required by law. HD Surgical, a custom surgical instrument & implant manufacturer for the Orthopaedic industry, has recently acquired certain assets of PAK Manufacturing, Inc. This new acquisition positions HD Surgical as one of the largest manufacturers of both forged and machined instrumentation in the USA. HD Surgical offers custom‐manufactured instruments, full service instrument repairs and refurbishing to OEM standards, as well as implant manufacturing capabilities. HD Surgical, a division of Harwood Design, was founded in 1990 and is an ISO 13485 Certified and FDA Registered company. The transaction supports HD Surgical’s strategy to continue as a North American instrumentation supplier offering design engineering and regulatory guidance submission strategies. Plans are underway to expand the company’s overall capacity, with a new building slated to begin construction in 2017.